The New High-speed, High-precision Hybrid Off-line AOI System Yamaha YSi-S - News Releases | Yamaha Motor Co., Ltd.
Yamaha Motor Co., Ltd. has succeeded in the development of a new automated optical inspection (AOI) system for off-line use that employs a combination of visible light, infra-red and laser inspection functions to achieve increased defect detection accuracy and speed. Named "YSi-S," this new product will be released in the autumn of 2010. Despite being an off-line system, YSi-S features a high-rigidity frame and designs for the lighting units, high-resolution imaging system and rotary geared laser unit that are the same as those on Yamaha Motor's high-end in-line type YSi-12 system to achieve unprecedented levels of accuracy, speed and reliability for an off-line type inspection system. Furthermore, this model adopts Yamaha Motor's "3S" (Sitting and Standing posture Support Layout) to better accommodate both standing and sitting operation, and the user interface is integrated with that of the surface mounter for improved operability. 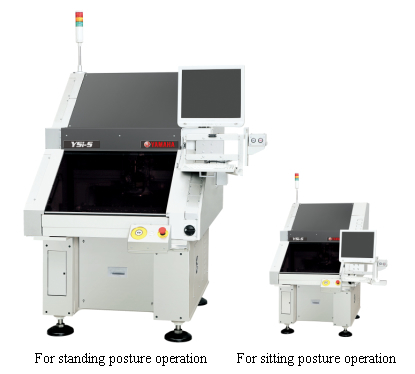 The new YSi-S model will be displayed at the 12th Jisso Process Technology Exhibition, the electronics manufacturing and surface-mount technology trade show to be held from June 2nd to 4th, 2010 at the Tokyo Big Sight exhibition facility (Ariake, Koto-ku, Tokyo). In recent years, there is increasing demand in the electronics manufacturing workplace for automatic optical inspection (AOI) systems to replace human visual inspection for detecting soldering defects on printed circuit boards (PCB) after the mounting of electronic components in order to ensure greater product reliability for circuit boards. Until now, however, the off-line AOI systems available for inspections other than those conducted in-line, such as after the dip process, after the robotic soldering process, manual soldering process or circuit board separation process, have been mostly desktop type systems in which it is difficult to achieve high levels of inspection accuracy, speed and reliability. YSi-S has been developed as an AOI system that solves this problem while also achieving excellent operability in off-line inspection, ensuring a high degree of inspection reliability with the lowest possible rates of defect detection failures and false alarms*. Utilizing our advantage as a comprehensive manufacturer of circuit board surface-mount equipment, including surface mounters, printers, inspection systems, etc., Yamaha Motor Co., Ltd. is able to integrate the control technology, imaging technology and SMT concept of these systems in order to provide products of greater quality and smoother operability in the production line. The latest lighting system (3-section dome illumination, RGB full color for the high/mid/low sections & infra-red for the high section) is adopted. The 3-section dome illumination system is designed to minimize shadows cast by taller electronic components to enable more exact imaging of the inspection objects. (2) High-definition 5 megapixel CCD camera with telecentric lens to achieve the highest level of inspection speed in class. Because it adopts the same optical system as Yamaha Motor's in-line type YSi-12 AOI system, it is possible to use the same inspection program interchangeably. A choice of three optical resolution levels is offered (before factory shipment) for selection based on the size of objects, such as general circuit boards, device components, etc., to be inspected. (4) The rotary-geared laser unit ensures accurate measurement of component heights without blind spots, not only for the flat surfaces but diagonal portions as well. (5) A "3S" (Sitting and Standing Posture Support Layout) is adopted to optimize ease and comfort of use for both standing and sitting operation by making the keyboard, mouse and display, etc., height adjustable to several levels. (6) Applicable for large PCBs (L510mm × W460mm) with improved space efficiency and operability. As an option, L650mm PCB application is also available. (7) The user interface proven on Yamaha Motor surface-mount systems is adopted. Its integration with the other equipment of the surface-mount production line means better usability and functionality. Large display and easily differentiated 9-color gradation display makes possible more intuitive operation.